The Witcher 3: Wild Hunt is a game developed by CD Project RED. It was made available for Microsoft Windows, PlayStation 4, and Xbox One. The Witcher 3 Xbox One version came out on May 19, 2015, just like the other versions available for the other two platforms. Both The Witcher 3 and its predecessors, The Witcher and The Witcher 2: Assassins of Kings are open-world action role-playing games which drew inspiration from the Polish series of novels of the same name. The end result was a critically-acclaimed game which managed to break sale records by selling over six million copies in six weeks. Almost every gamer loves open world games. It’s hard not to love them, especially with the countless possibilities they provide. The Witcher 3 brings to the table a world that combines everything you love about the preceding game, Skyrim, and The Legend of Zelda in its various personifications. Players get a rich world, rendered with top notch graphics (which we’ll get to later), and the best part is that it all feels very real. To some, the fact that you spend most of the time journeying on the back of your faithful horse is very reminiscent of Red Dead Redemption. The Witcher 3 doesn’t try to be something it’s not. It advertises itself as a RPG and it wholly delivers in this department. You slay monsters, you gain gold, you loot for objects and potions, and you level up. Grinding is very present, as well as question, all of which are elements RPG players are all too familiar with. Where’s the catch, though? They all feel somewhat refreshing. There’s an element of novelty and the best example is the fact that the quests don’t feel dull, annoying, and repetitive. You have a main storyline to follow, that’s a given. And, unfortunately, this can often be the weakest point of open world RPGs. There is a thin line between an immersive narrative thread and something that can get infuriating and repetitive. One thing that we can say for certain is that the game’s main storyline gives players the liberty of choosing to do something else in the meantime. Moreover, you’ll be connected to the storyline at all times. The only downside can be the fact that a large portion of the quests are level-capped, making them more confining. The Witcher 3: Wild Hunt follows Geralt of Rivia, protagonist in previous installments of the franchise as well. This game serves as a conclusion to his story, which becomes even more personal in Wild Hunt. As Geralt embarks on a journey of discovery and seeking, the world around him is shifting, rapidly changing. The game opens up with Geralt, side by side with senior witcher Vesemir, as they’re trying to find Geralt’s lover, Yennefer of Vengerberg. The situation flips when Yennefer finds Geralt instead, announcing him that the emperor of Nilfgaard summoned Geralt to Vizima. The Witcher 3: Wild Hunt is available for Microsoft Windows, PlayStation 4, and Xbox One. All versions were released at the same time, a very bold and daring move, especially given the failed precedent represented by Assassin’s Creed: Unity. Needless to say, CD Project RED’s decision to spread the release of the game across all platforms wasn’t without its faults. Several people have complained about framerate and loading times, particularly where Novigrad is concerned. Xbox has attempted to ail this issue by dropping some patches, but there’s little that they could have done about the framerate. The Witcher 3 Xbox One version separates itself from the other versions of the game through its framerate and 900p specific, inferior, let’s face it, to PlayStation 4’s 1080p. Because of this, it gets a drop of points in the game visuals department and the lags during loading times cut off some more in gameplay. Naturally, storyline and lore remain the same and they’re both immersive and well-constructed enough to warrant a maximum score. In conclusion, The Witcher 3 Xbox One version shows its flaws in the performance department, though that definitely varies from one case to another. 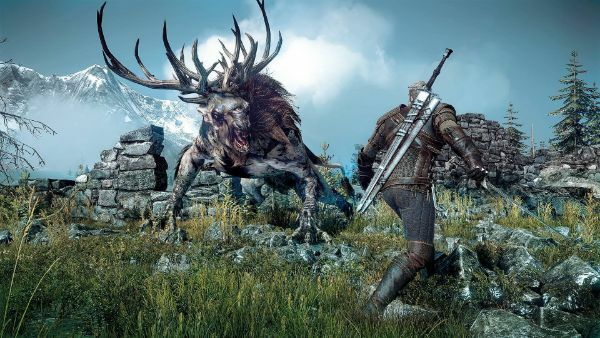 But anyone who loves an immersive environment, refreshing RPG elements, and emotional flavors to a storyline will absolutely love Wild Hunt. The best part is that you don’t need to have played the previous games for this particular experience, though it certainly would be a welcomed bonus if you wish for full immersion.